You might not know this, but LinkedIn has an editorial calendar, which is publicly available through searching for ‘LinkedIn Editorial Calendar’, or clicking here. If you are publishing articles on LinkedIn and would love one of these to feature on Pulse, then following their suggested topics increases your chances of that happening. This month, for instance, has the topic ‘How I Lead’, next month’s is ‘Harnessing Creativity’. One solution for this is to create an editorial calendar, in a similar way to LinkedIn's one. Assign angles to different people in the office, so that the breadth of the topic is explored. Having an editorial calendar will lend a structure to your business blog, think of it as the skeleton for the month, to which other topics and articles can be added. 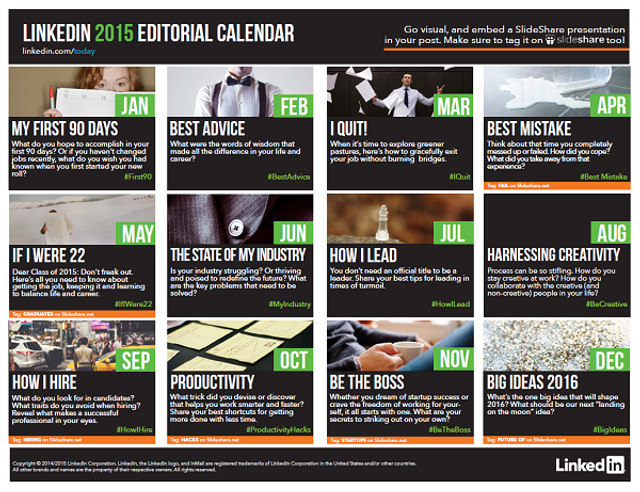 This calendar should be a key element of your strategy to establish yourselves as a thought leaders in your field. Here are some tools you can use to facilitate the process.